Mojo sauce is used mainly in Cuban cuisine and pairs particularly well with pork. There are many variations but most contain garlic, olive oil and citrus juice — usually sour or bitter orange. Occasionally, fresh herbs, cumin and onion are added. Bitter orange can be difficult to find unless you’re near an international market. Combining freshly squeezed navel or Valencia orange juice with freshly squeezed lime juice makes a great substitute. 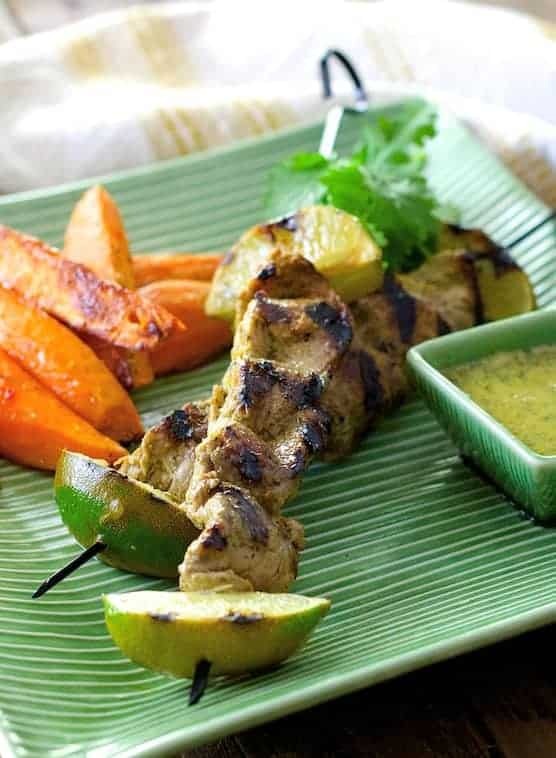 The mojo sauce for this dish serves two purposes: Part is used as a marinade and the remainder later as a dipping sauce for the finished pork skewers. Toasting helps bring out the flavor of ground cumin. To toast ground cumin, place in a dry nonstick skillet over medium-low heat. It will become quite aromatic after about 30 seconds and the edges may be lightly browned. Immediately remove it from the heat or you may burn it. If you have more time, start with whole cumin seed, toast until aromatic, cool, then grind in a spice grinder. I like to use zipper-top bags when marinating meat or poultry because a smaller amount of marinade will cover more of the surface. Just by moving the bag around, any surface that wasn’t in the marinade initially will get immersed. When you remove the protein from the bag, just seal and discard the marinade. If you don’t eat pork, this marinade and sauce also works with chicken and shrimp. However, you don’t want to marinate shrimp longer than 30 minutes or it will “cook” in the acid. Pepper jelly-glazed sweet potatoes are one of my favorite ways to enjoy sweet potatoes, which are just coming into season. I cut into wedges, roast then glaze with a combination of melted pepper jelly and cider vinegar. They pair perfectly with this citrusy pork. This really does look and sound YUM!